To truly experience a new culture, one must experience the cuisine! 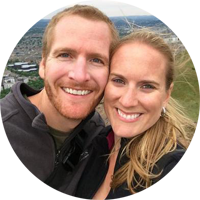 Our visit to Bratislava was our very first time in Slovakia, and we couldn’t wait to try local and traditional dishes. We had read that the food in Slovakia is quite hearty, including lots of meat (especially pork), potatoes, dumplings, cheese, and thick sauces. As we quickly found out, this assessment was accurate. There weren’t too many vegetables to be found, other than healthy portions of cabbage in the form of sauerkraut. Nonetheless, we indulged in our fair share of substantial meals with more than ample-sized portions. Unlike where we live in the States, lunch is traditionally the largest meal of the day, with lighter portions for breakfast and dinner. Although not every meal we ate in Bratislava can be classified as traditionally Slovak, we wanted to share where and what we ate to a) make you hungry and b) introduce you to places you might want to try on your next visit to Slovakia’s capital city. 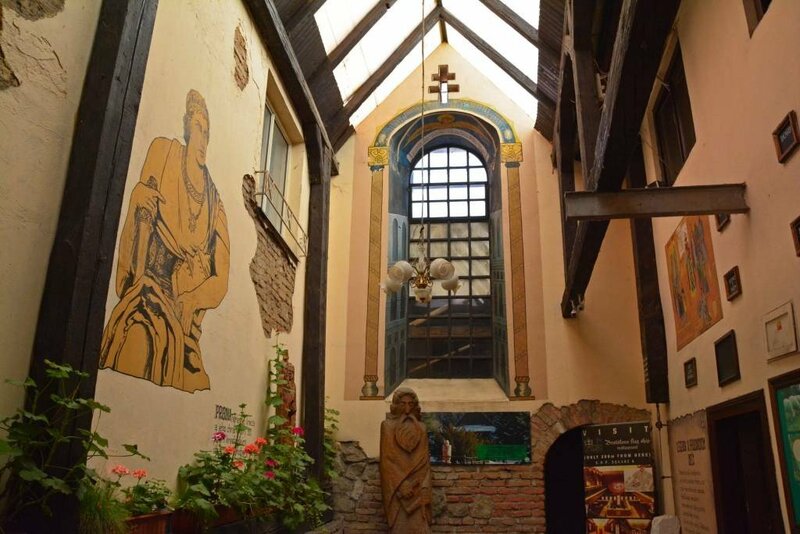 The Flagship Restaurant is THE place to go in Old Town for traditional Slovak food and drink. Tourists and locals alike dine in this large, yet cozy establishment. 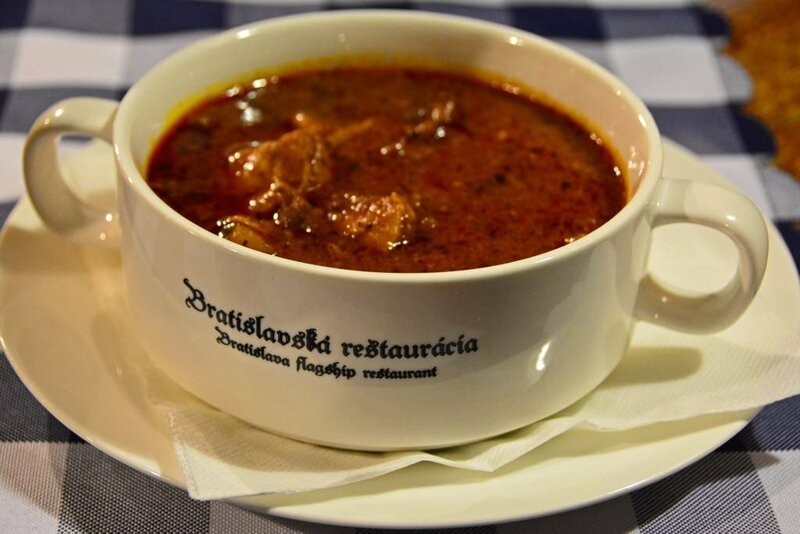 Sam ordered the cauldron goulash (kotlíkový guláš), and while it is traditionally more of a Hungarian dish, it is well received in Slovak cuisine. Goulash is a soup made in cauldron and includes pork, beef, potatoes, and pepperoni. 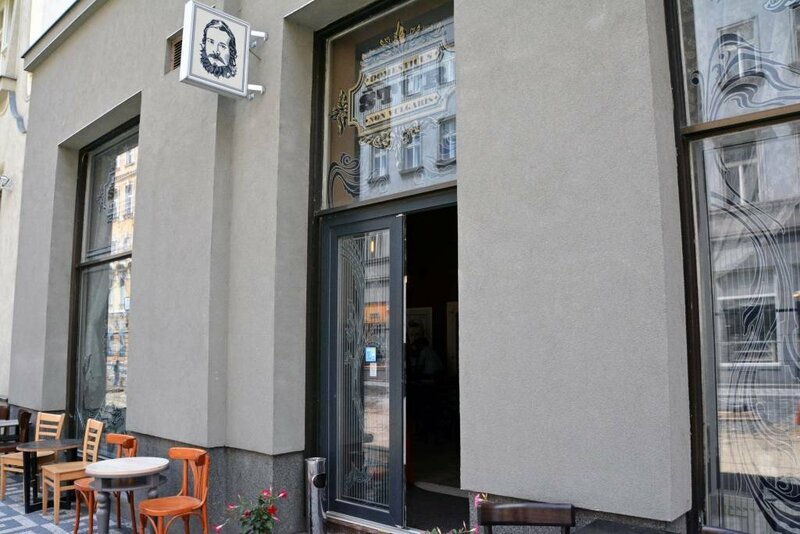 When in Bratislava, its almost a sin to visit and not try the traditional Bratislava roll (Bratislavský rožok). 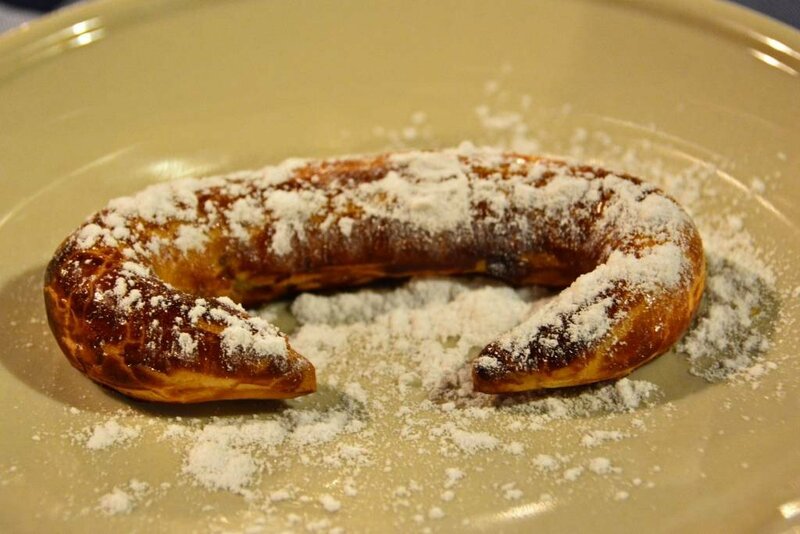 It has been baked in the city since the 16th century. 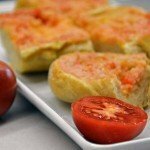 The roll is made of yeast dough consisting of 30% fat, and the most authentic rolls contain either walnut or poppy seeds, which must make up at least 40% of the weight of the roll. It’s a semi-sweet treat that is usually enjoyed with a morning coffee or as a dessert or evening snack. I ordered the bryndza-filled dumplings (bryndzové pirohy). 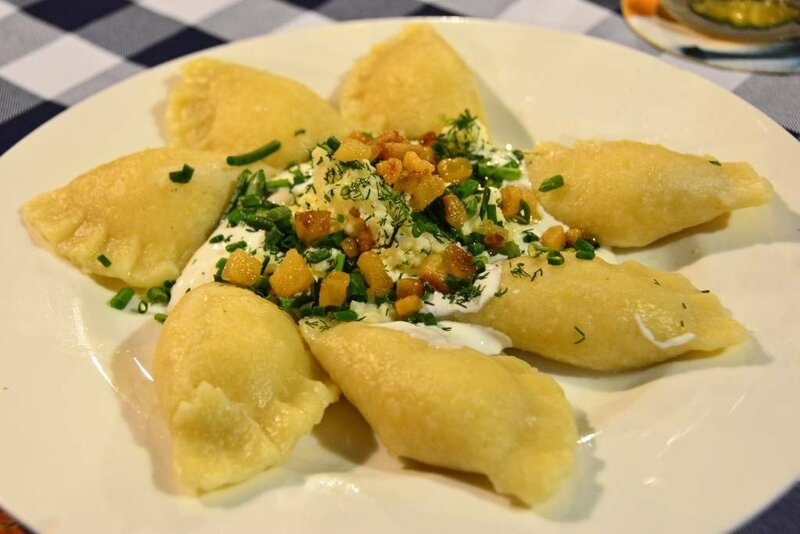 This heavy entree is potato dumplings made from potato dough, filled with special slovak bryndza (sheep) cheese and topped with smotana (like sour cream), spring onion and bacon. We enjoyed our lunch compliments of the Bratislava Tourism Board. Their marketing manager, Betty, joined us for lunch and ordered meatballs (masové guľky). 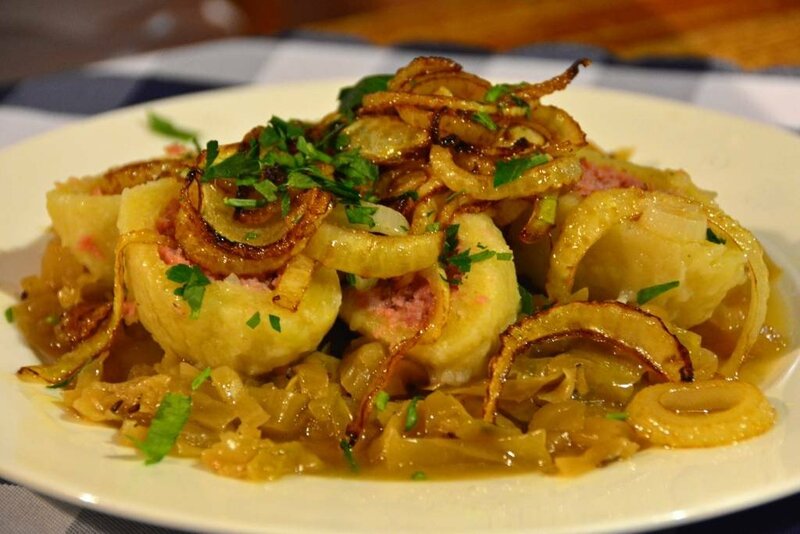 Made from potato dough, these Slovak-style meatballs contain minced meat, served over steamed cabbage, and topped with roasted onion and spring onion. As if we weren’t stuffed enough, Betty wanted to make sure we had the full Slovak cuisine experience ordered TWO types of dessert; though they were similar in ingredients. 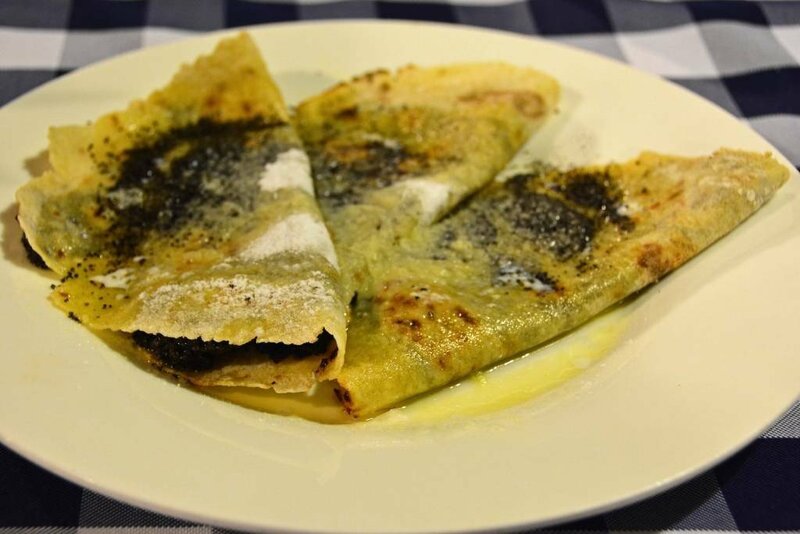 Poppy seed pancakes (makové lokše) are made from potato dough, fried on a pan without any oil. Inside are poppy seeds and on the top is melted butter, powdered sugar, and poppy seeds. 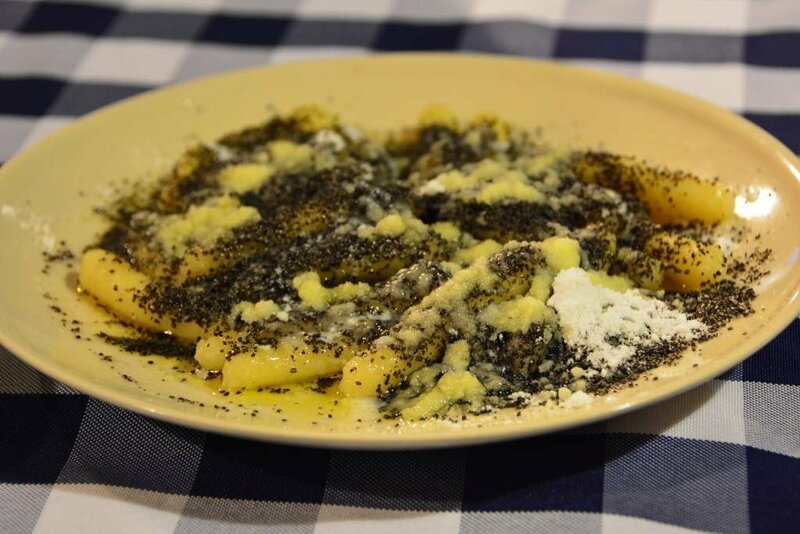 This was not our favorite dish, as neither one of us are huge fans of poppy seeds, but at least we gave it a try! As mentioned, the second dessert was very similar in ingredients, but we found it to be slightly more enjoyable. Makové šúľance are small rolls made from potato dough, boiled in the water, topped with poppy seeds, powdered sugar, and melted butter. To say we left the Bratislava Flagship Restaurant full would be an understatement! 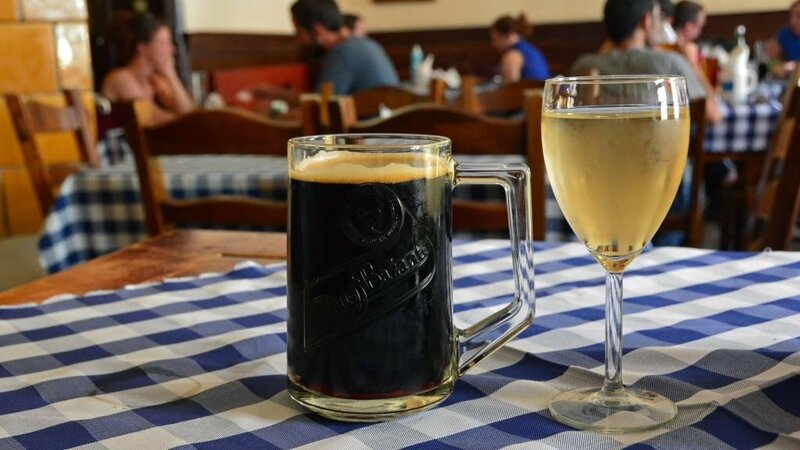 A sister-restaurant to the Flagship Restaurant, this 11-room pub just outside of Old Town also offers some of the most authentic, traditional Slovak food in town. Following a long day of exploring the city, we needed a refreshing and relaxing beverage. Sam ordered a dark Zlatý Bažant (local Slovak beer) and I ordered a Slovak white wine, Welschriesling (Rizling Vlašský). For this traditional meal, Sam ordered halušky, specifically, bryndzové halušky s ostiepkom a slaninou, which is potato dumplings with bryndza (sheep milk cheese), topped with oštiepok (smoked sheep cheese) and bacon. If you haven’t gathered by now, Slovaks use A LOT of potatoes in their cooking. This comes from the fact that historically potatoes were the only agricultural product which could be cultivated with poor quality soil and long, cold winters. 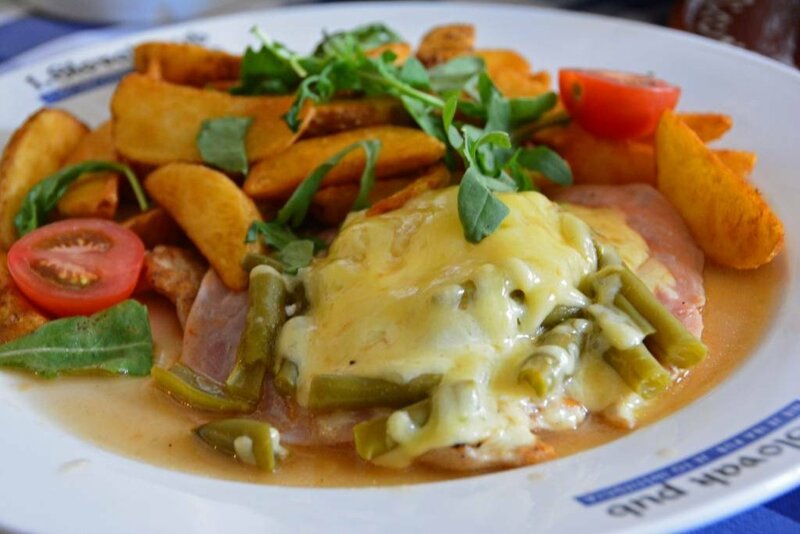 I went with the eastern Slovak schnitzel (východniarsky rezeň)– chicken breast, green beans, ham and cheese, served with roasted potatoes. It was ok; lacking in flavor just a little. 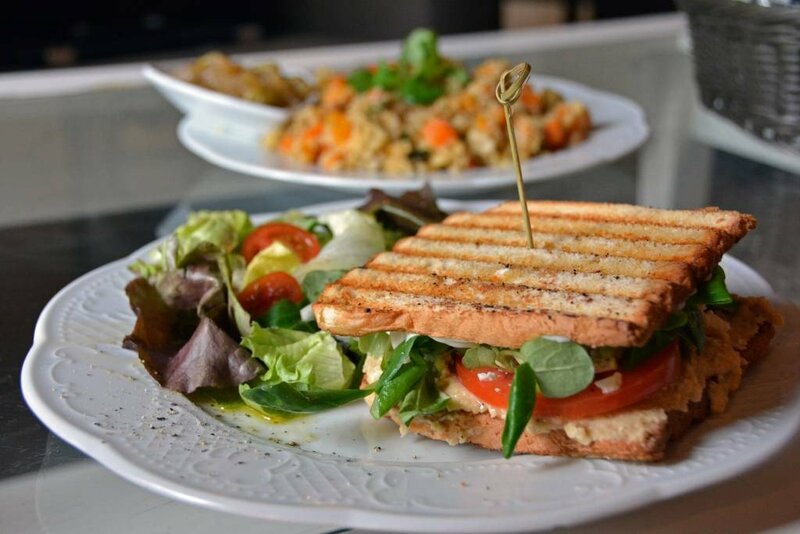 When you’re craving something other than a traditional Slovak meal, there are plenty of other European-influenced places to choose from, like the Parisian-inspired Bistro St. Germain. 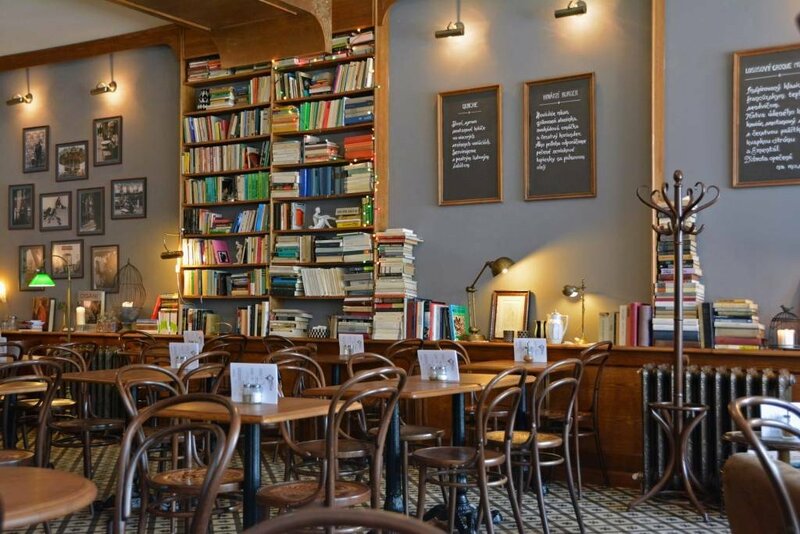 With a classic retro bookstore feel, complete with leather arm chairs, Bistro St. Germain is the perfect place to relax and enjoy some delicious eats! 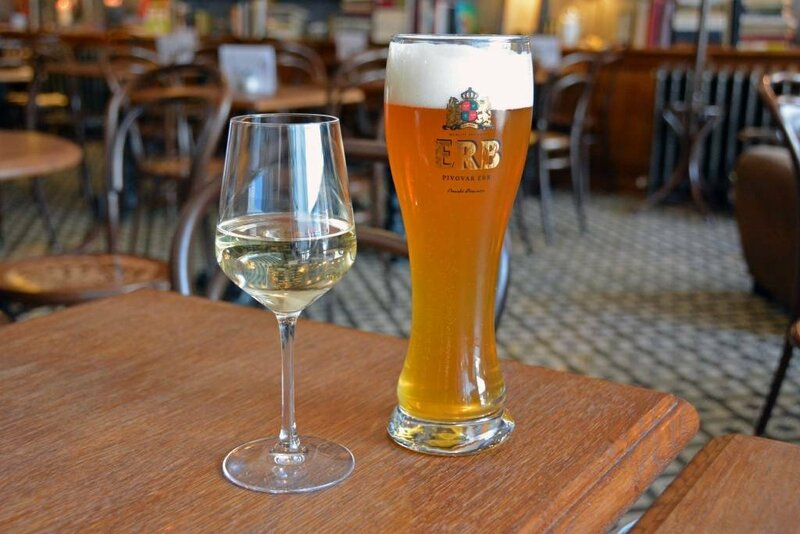 Sam was delighted with his selection of ERB weizen (wheat) beer and I couldn’t have been more pleased with my elderflower-infused white wine. At first glance, I was slightly let down with the portion size of my entree selection given how large the portions had been up to this point, but my disappointment disappeared the moment the food hit my tongue! 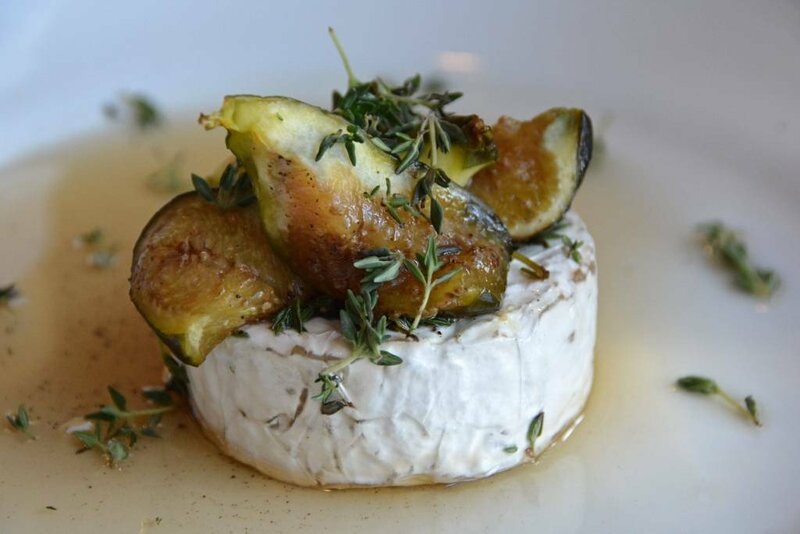 Camembert is a local soft and creamy, surface-ripened cow’s milk cheese, and it was exquisitely flavored with figs, maple, and thyme- a combination that was absolutely superb. 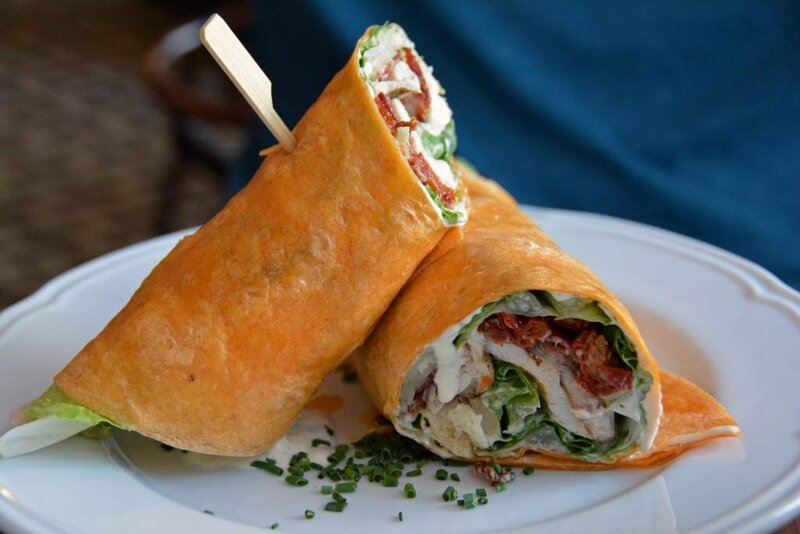 Sam went with the popular chicken cesar wrap– a wheat tortilla generously stuffed with grilled chicken on Roman lettuce with fried bacon, parmesan cheese, fresh croutons and crisp dried tomatoes. 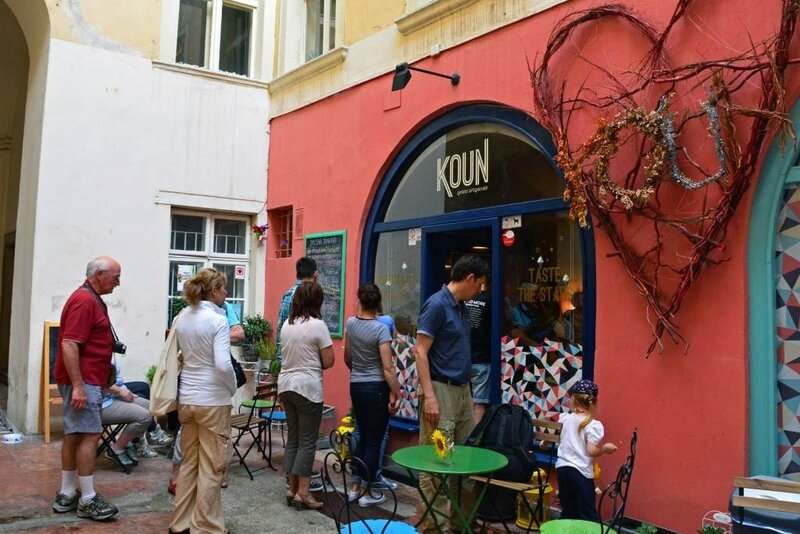 We initially planned to visit Štúr Café for breakfast. There are two locations that we know of and the first one we went to (in Old Town) only served coffee and specialty cakes. 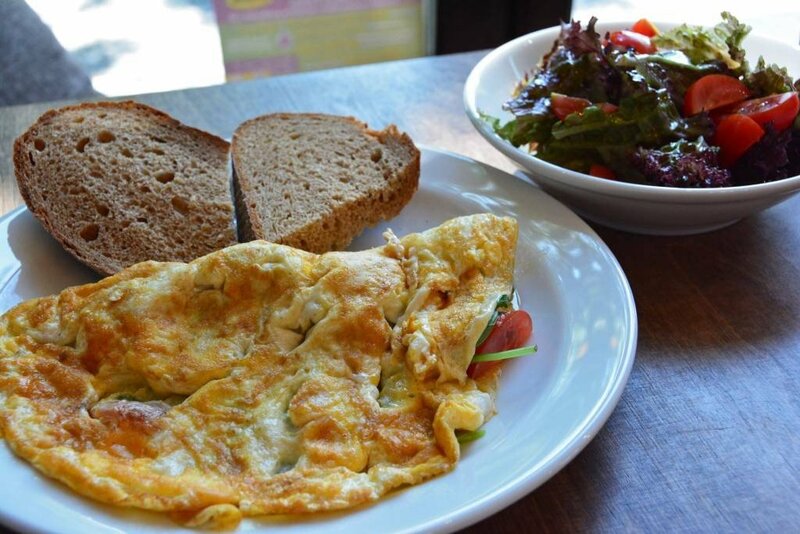 We tried the other location the following morning and for whatever reason, there wasn’t much breakfast food on the menu, even though we had read that Štúr was an excellent choice for all-day breakfast. Oh well… seeing as it was a little later in the morning, we ordered lunch options instead. 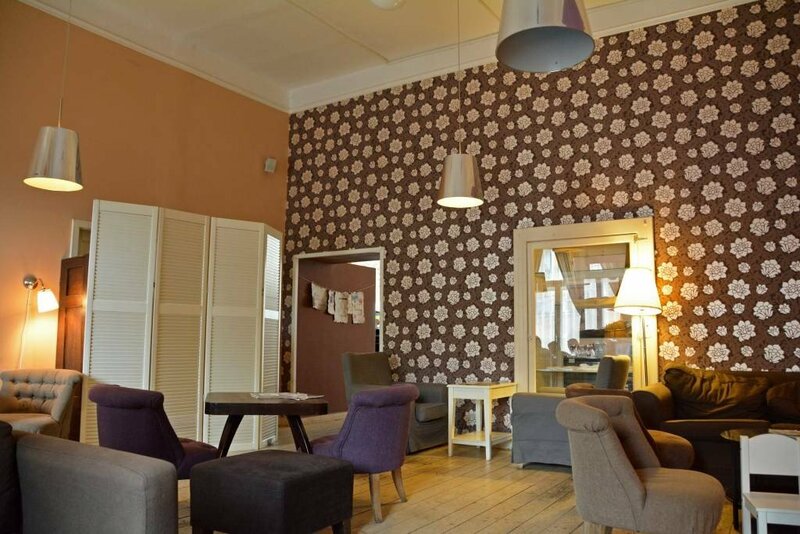 The cafe has a comfy feel with plush chairs and ottomans in a relaxed and cozy setting. I ordered the veggie hummus panini, as my body was craving some vegetables, and Sam selected the veggie couscous flavored with pumpkin. His meal, so full of flavor, was the winner! I ate most of my panini and then graciously offered to help him finish his enormous portion of couscous. Sam enjoyed his latte, but I was pretty disappointed with my lemonade selection. Trying to hold on to the elderflower cravings prompted by the wine I enjoyed the day before at Bistro St Germain, I ordered an elderflower-flavored lemonade. There was hardly any flavor to it and it wasn’t cold. They were able to put more flavoring in, which helped a little, but they had no ice. WHAT?! What cafe doesn’t have ice? How do you make ICED coffee? It was a huge let down, considering the price we paid for the lemonade. 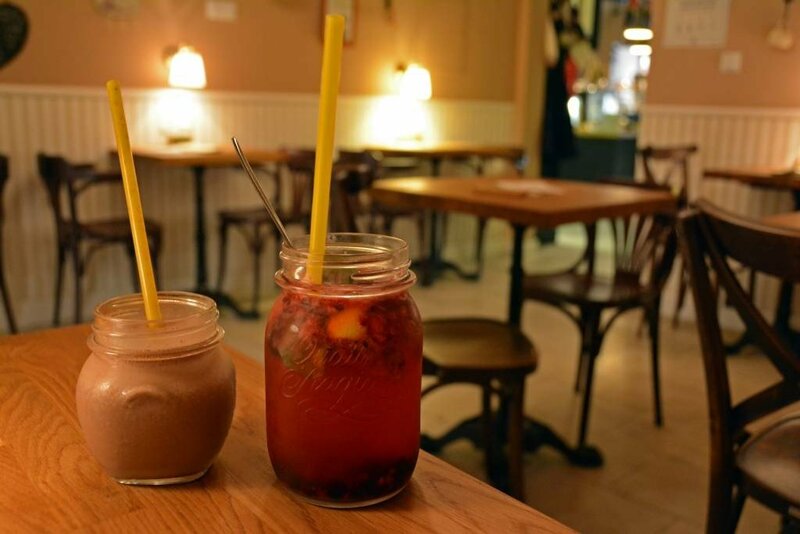 Lemonade is kind of a ‘thing’ in Bratislava. 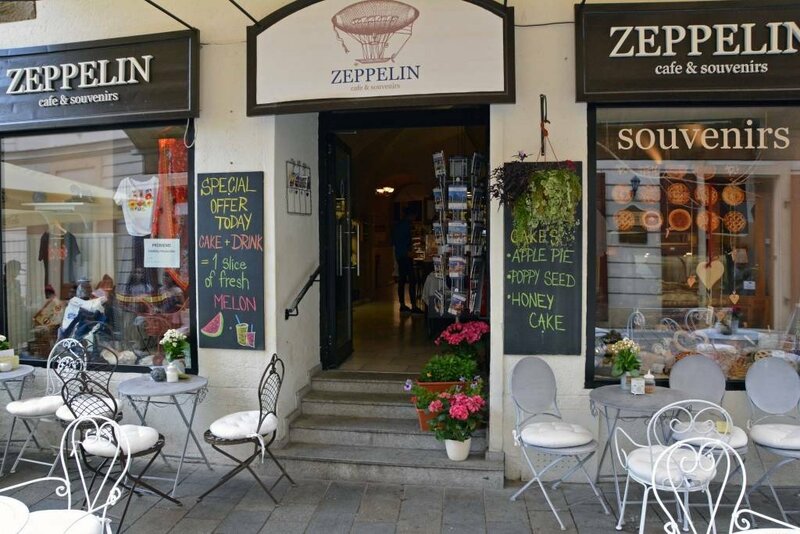 Many restaurants/cafes are made famous for their lemonade offerings, and Zeppelin is among the most well-known. 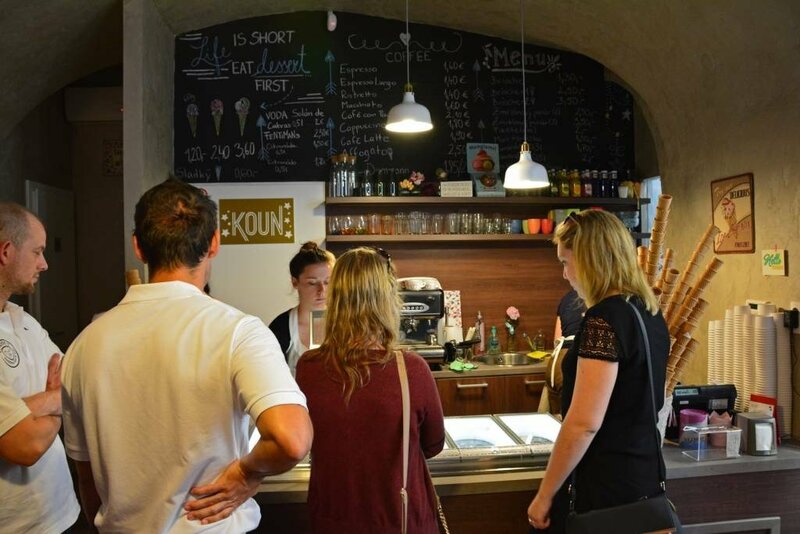 They offer a delicious selection of home-made cakes and pastries, coffee, lemonade, milkshakes, and a beautiful selection of Slovak souvenirs. With a prime location just off the main square in Old Town, Zepplin is a great place to relax and enjoy a tasty (yet pricey) treat. Sam ordered a chocolate milkshake and I went with an indulgent fruit-filled lemonade. It was a little too ‘seedy’ and ‘pulpy’ for my liking, but the flavor was excellent, so if you don’t mind a little ‘chunk’ in your drink, give it a try! 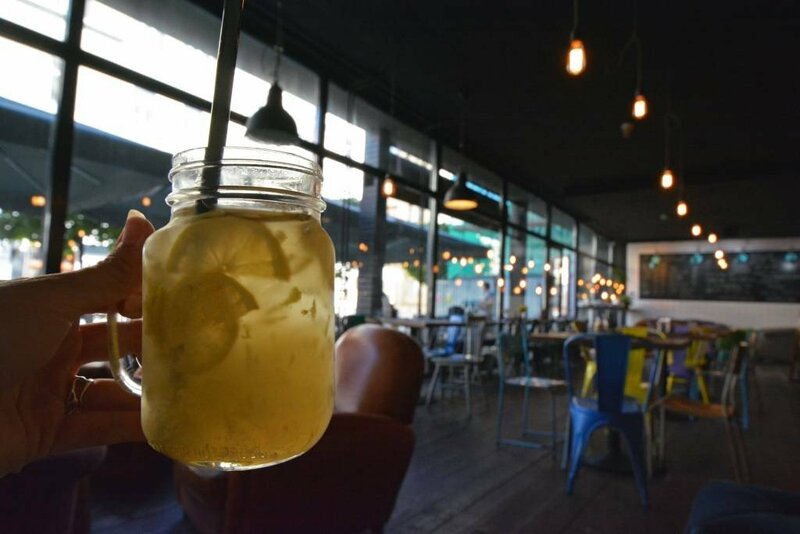 Where we found the BEST lemonade in the city was at Urban House. In fact, we visited twice during our 6 days in Bratislava. 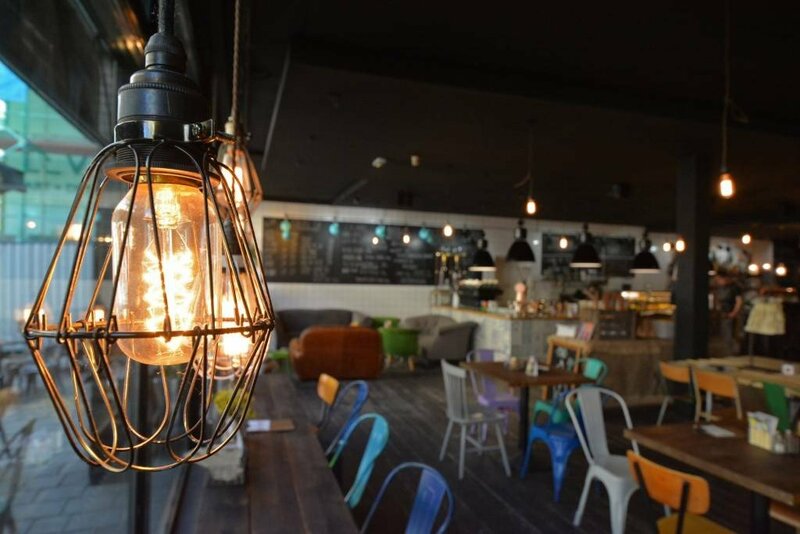 We loved the atmosphere at Urban House; the drinks were outstanding and the prices were reasonable. 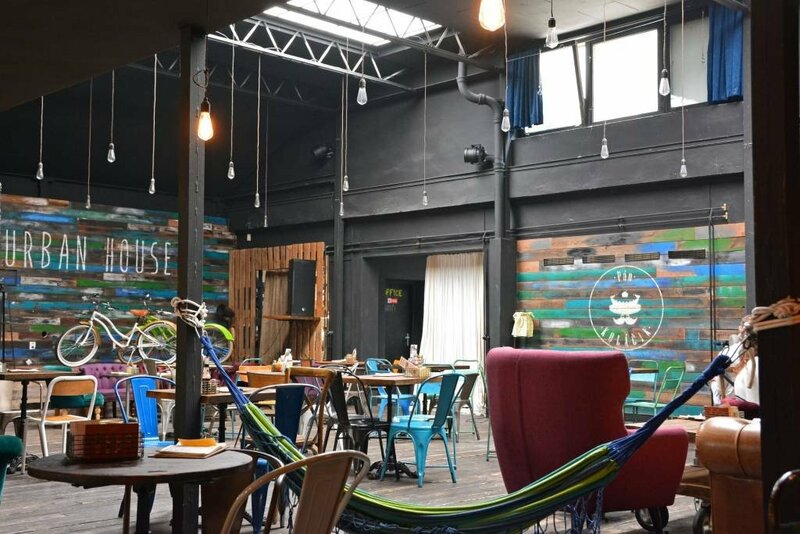 With funky, urban décor and everything from colorful metal chairs to plush sofas and hammocks, this is THE place to hang out with friends, get some work done on your laptop, or even enjoy some live music. 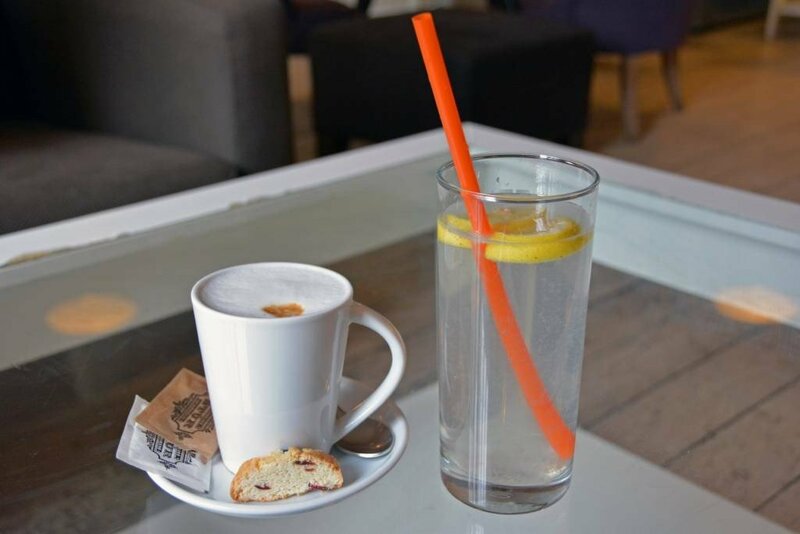 We only had drinks during our visits, but Sam can attest to the fact that the coffee drinks are outstanding and the lemonade, as I mentioned, was the BEST of all those I sampled. The strawberry-rhubard (not pictured) was scrumptious and not too ‘chunky’. 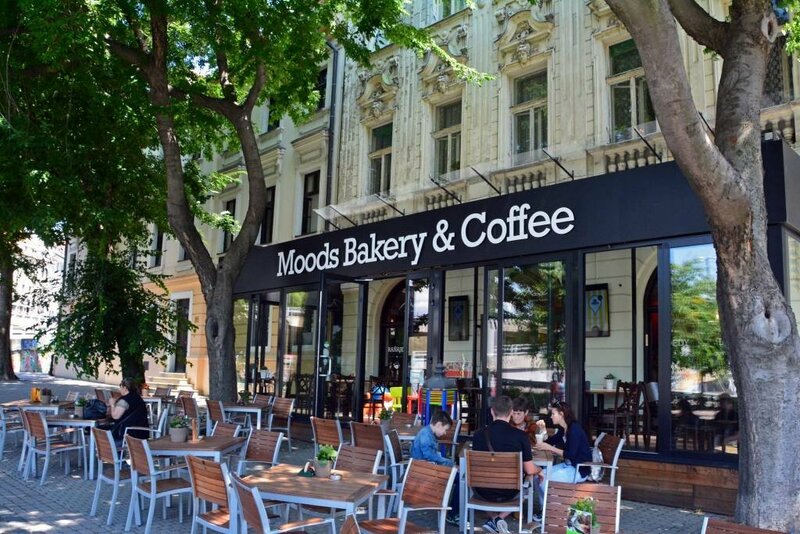 When our first attempt to eat at Štúr Café for breakfast failed, we came upon Moods Bakery & Café. There are various convenient locations all over the city, so you’re never far from Moods. 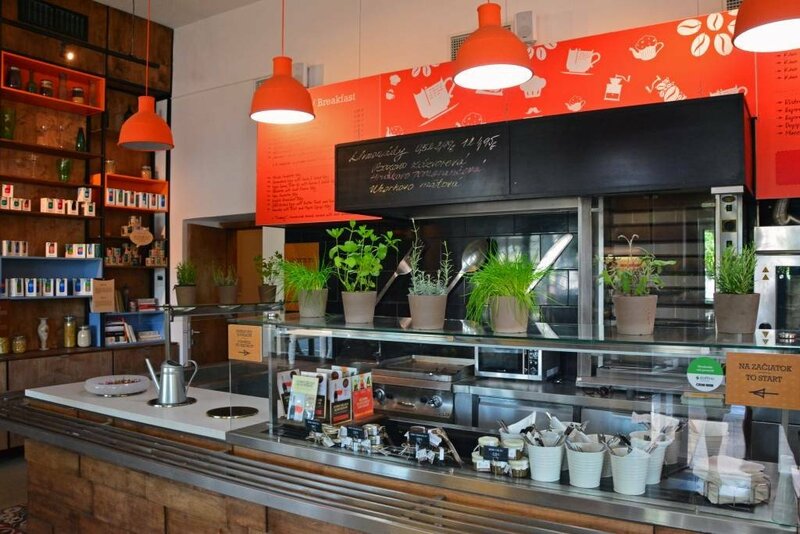 With a delicious selection and coffees and teas, and a full breakfast menu, it’s a great place to start the day! The breakfast portions were hearty and for a good price, but I wouldn’t normally expect to have a salad served with my omelette. Honestly, though, I was grateful for the veggies! And last, but certainly not least, there’s Koun! We wouldn’t have known about this slightly hard-to-find gem if it weren’t for the advice of Betty at the Tourism Office. There is pretty much always a line, and for good reason… the gelato is AMAZING! Their flavors change every day, so check their Facebook page for what’s available on a given day. Or simply show up like we did, sample what looks/sounds good, and make the tough decision of narrowing down your final selection. 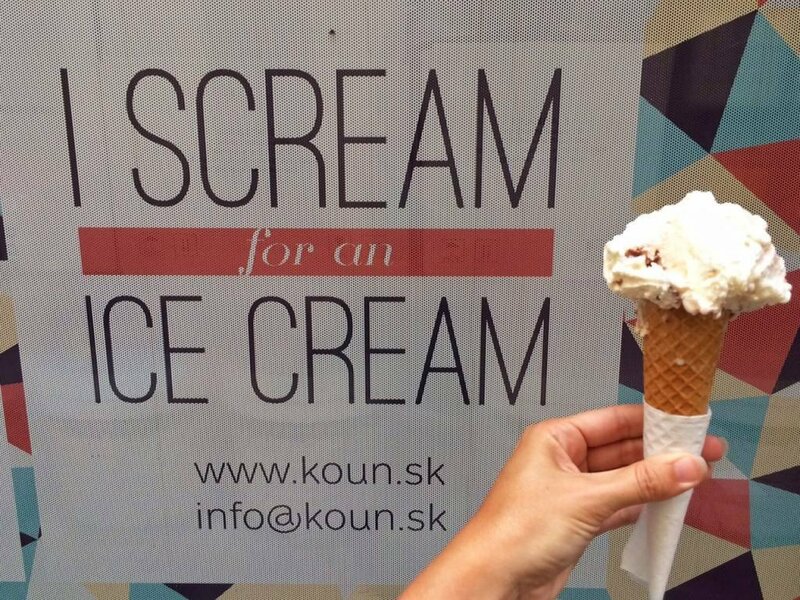 Hopefully, we’ve made your mouth water, and given you a few ideas of places to check out on your next visit to Slovakia’s capital city! actually sounds a lot better than I expected! Some of the food looks really interesting, other things just look tasty. There’s a decent variety of choices… and even when you need something different, there’s quite a few other European choices around town. Great city to explore! I literally just finished dinner and I’m hungry again. All that food, beers, wine and lemonade looks amazing!! 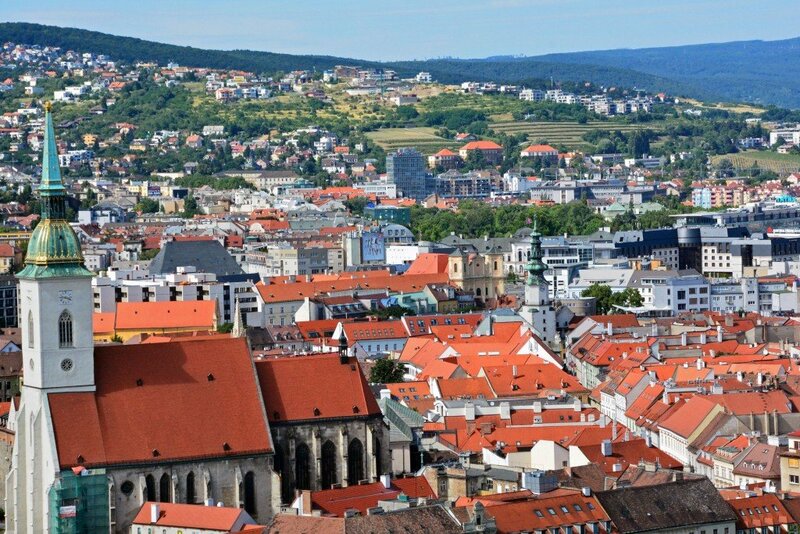 Slovakia is now on my radar for places I need to go! Definitely worth a visit. We could’ve stayed much longer in Slovakia! The food looks delicious and as you rightly said quite hearty and rich. Thank you for sharing, though, I’m starving now! Ha ha! You’re welcome! It’s great that you only really need one big meal throughout the day and you’re set! 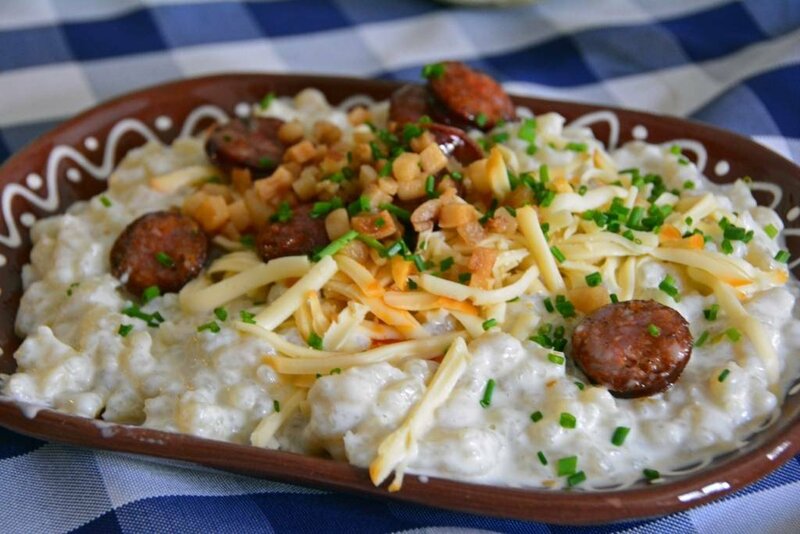 Slovak food looks great. Nice and filling… Just the thing needed for a hungry cyclist! Yes, carbs galore! Perfect for the hungry cyclist! Everything looks so delicious! 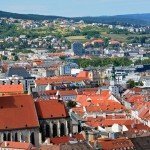 We’re supposed to move to Germany next year for just 10 months and I’ve been debating about whether to add Slovakia to my list of weekend destinations. I think it’s going to have to be added, I really need to sample some goulash! You definitely should. 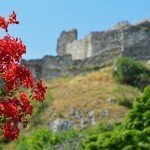 It’s a beautiful country! Wow! You did a great job finding the best foods. Everything looks delicious. The goulash and the dumplings are calling my name right now. We have a habit of grazing throughout the day on a bunch of different foods when we’re traveling. 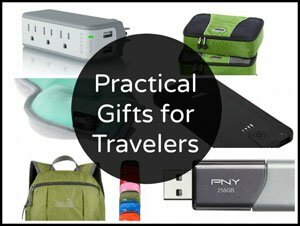 It’s a great way to be able to try an array of things without overeating. Exactly! 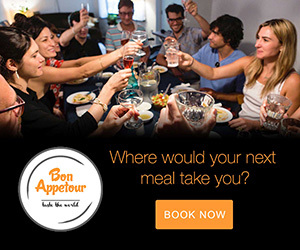 Do your own mini food tour. It’s a good thing you guys do a lot of walking and hiking! All that food is definitely hearty. But its so full of cheesy goodness, I don’t think I could resist! And I’m with you on the seeds and pulp. I like my drinks to be all liquid. For real! We’d weigh a lot more if we didn’t walk everywhere and do some hiking! I really want to try the Bratislava roll. I love semi-sweet things like that. All of these places look amazing. I would love to try them all. There certainly are plenty of options!! Definitely putting this on my bucket list! The food looks amazing! Especially when it’s mostly meat and less vegetables. I do like vegetables but I love meat more haha. 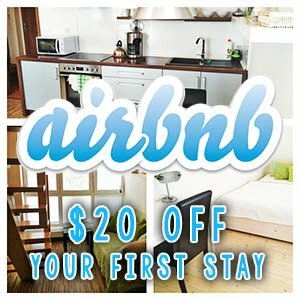 So I think I will enjoy visiting this country and eating there. Thanks for sharing! Oh man, I’m the total opposite! Need veggies!!! So funny to read slovak names of foods in english post 😉 How did you like bryndzove halusky? I’ve heard foreigners say it smells like old socks but it’s delicious 😀 I love them (obviously)! Enjoy! Lots of delicious food to try!